Woodsy stuff is sure having quite the moment right now. Whether it's a faux veneer or the real deal, the right amount of wood in your decor can add a hint of nature to any cluttered living space. 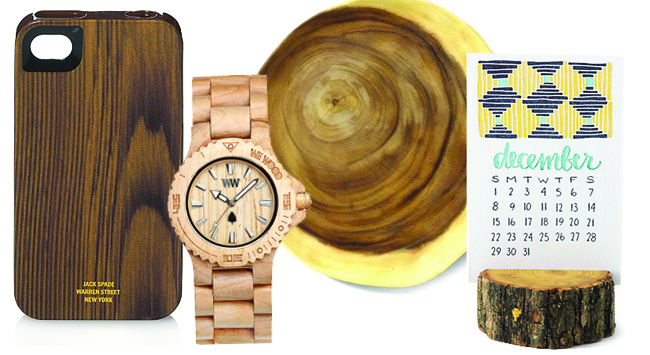 Here are a few woodsy items I'm eyeing right now. Obviously this wood trend has also inspired me in the kitchen! 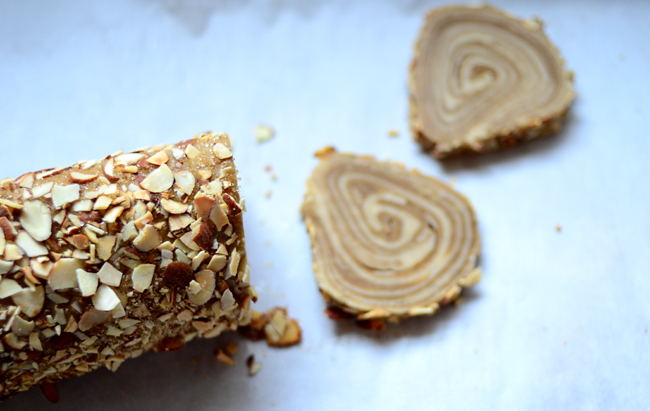 With some clever rolling and slicing, light and dark colored cookie dough can resemble a sliced tree trunk...and they'll taste better, too. With the addition of a few spices and chopped almonds as "bark," these cookies pack plenty of flavor. (Unless you are a woodchuck, of course. Then you might prefer the wood.) 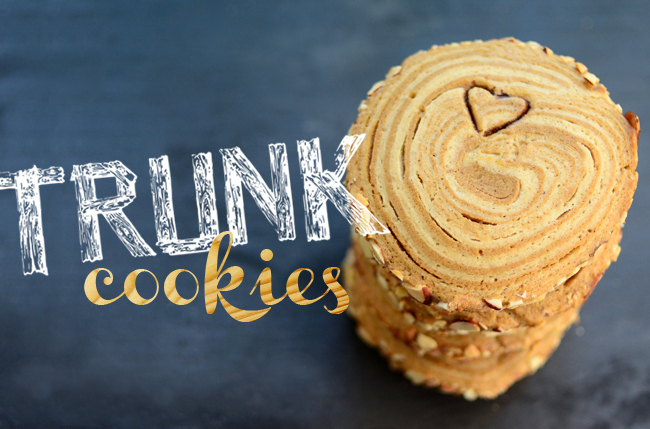 Anyway, here's the breakdown on how to make your very own Trunk Cookies. In a bowl, combine the flour, cardamom, salt and baking soda. Set aside. 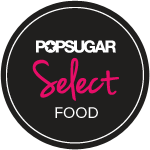 In the bowl of an electric stand mixer fitted with the paddle attachment, beat the butter and sugar on medium speed until light and fluffy. Add the honey, egg and vanilla. Continue mixing on medium speed until well blended, about 1 minute. Add the flour mixture and mix on low speed until the dough comes together. Scoop out the dough ball onto a sheet of plastic wrap and smooth into a flattened disk. Wrap tightly in the plastic and refrigerate until chilled, at least 1.5 hours. Dough can be refrigerated for up to 3 days or frozen for 1 month. In a bowl, combine the flour, salt, baking soda, cinnamon, ginger and nutmeg. Set aside. In the bowl of an electric stand mixer fitted with the paddle attachment, beat the butter and sugar on medium speed until light and fluffy. Add the molasses and egg and continue to mix on medium speed until well blended, about 1 minute. Add the flour mixture and mix on low speed until the dough comes together. 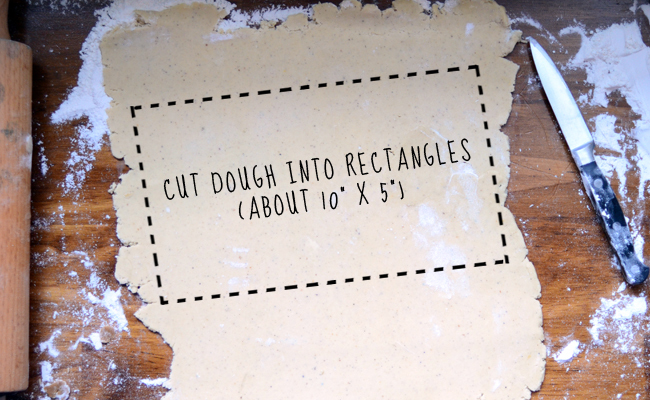 Scoop out the dough ball onto a sheet of plastic wrap and smooth into a flattened disk. Wrap tightly in the plastic and refrigerate until chilled, at least 1.5 hours. Dough can be refrigerated for up to 3 days or frozen for 1 month. 1. Working with your chilled disk, roll out the gingerbread dough on a large floured work surface as thin as you can without it tearing. Trim the edges to create a rectangle about 10 inches wide and 5 inches tall. Collect scraps, re-roll and trim to make as many rectangles as possible. Use lots of flour to prevent sticking! 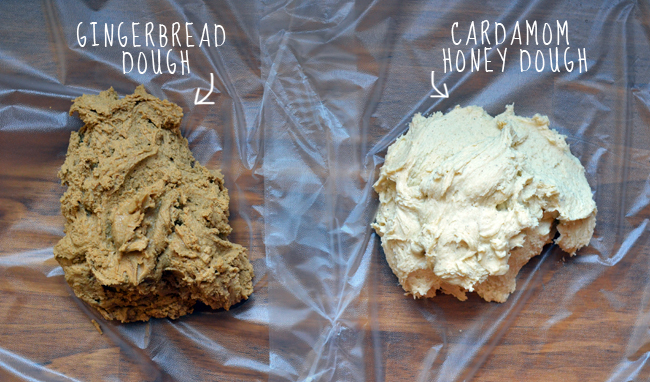 Next, roll out the cardamom-honey dough just like you did with the gingerbread dough and create as many rectangles as possible. 2. Starting with the dark gingerbread, stack each rectangle on top of another, alternating colors. Remember, it's OK if it doesn't look perfect or the dough tears a bit..it's supposed to look natural! 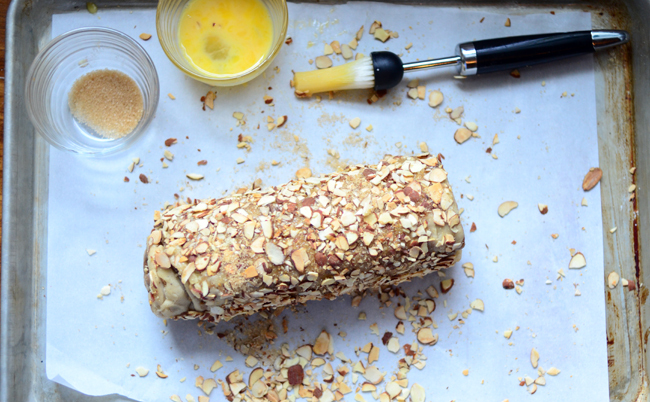 Once all the dough sheets are stacked, tightly roll into a log, starting with a short side. Wrap the log in plastic wrap and chill the freezer until firm, about 15 minutes. 3. Preheat the oven to 350 degrees F. Line a baking sheet with parchment paper. Beat the egg in a small dish. Remove from freezer, unwrap and place chilled dough on a clean surface, and use a pastry brush to cover with the beaten egg. 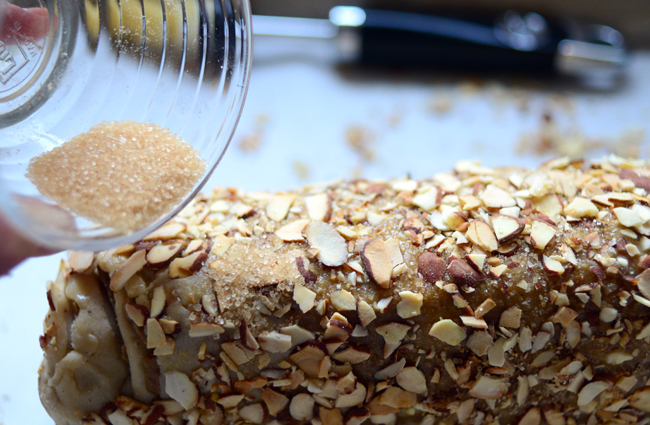 Cover with toasted almonds and sprinkle with turbinado sugar. Slice the log into 1/4" rounds, then transfer to baking sheet. 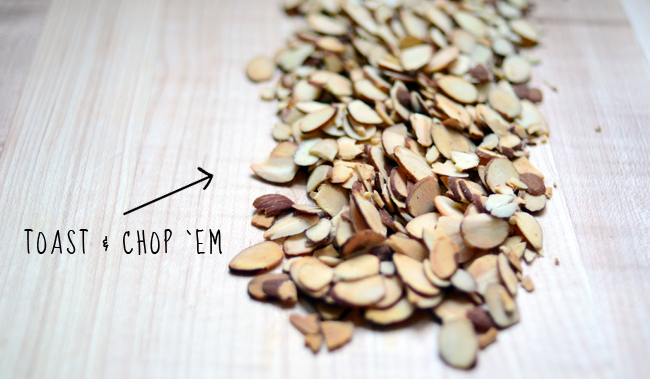 Add more almonds around the edges if needed. 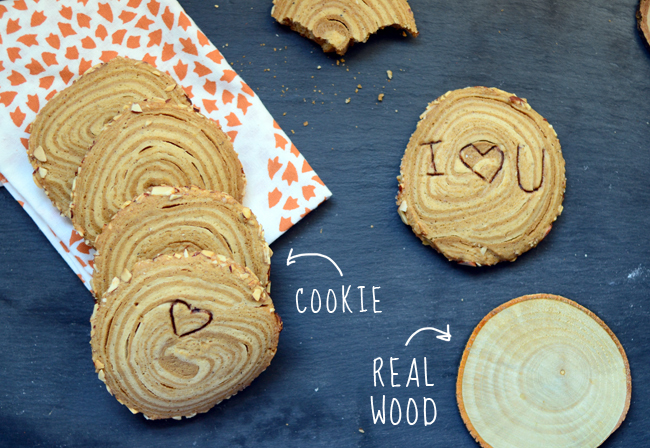 If you want to, use a sharp knife to "carve" a message or initials into the cookie. Bake for 12-15 minutes or until edges are golden. Let cookies cool completely before you use the brown food decorating pen to darken carvings. Feeling outdoorsy yet? 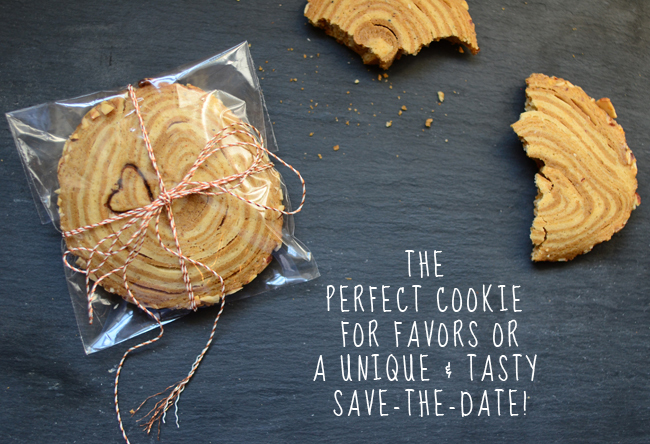 These cookies are delicious everyday, but if you have a wedding coming up, trunk cookies are the perfect favor or save the date. Carve the bride + groom initials or even the wedding day into the dough. These are way too fun! These are adorable! 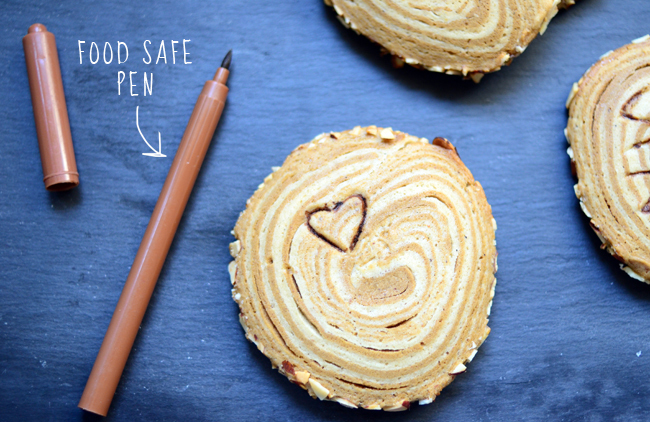 Did you carve the cookies and use the food safe pen before or after baking? Also, where did you get the plastic bags you wrapped the cookies in? Thanks! Thanks! Yes, I carved the cookie before you bake with a knife. Once they are cool, use the food safe pen to darken the carving. You can find those bags at any craft store...usually in the wedding favor section. wow, these are adorable and totally have me drooling! :) Can't wait to make them! Great, I just ate some bark thinking it would taste this good. These are so cute! I'm including them on my weekly links roundup next week! !